The main cause of derailments in industrial rail yards is over-wide track gauge. Locomotive and freight car wheels can exert as much as 4000 lbs. of side pressure against the rails. If the ties are spongy, they can lose their spike-holding strength and allow the rails to be pushed over from wheel side pressure. A between-the-rails derailment requires crane-lifting to put the car or engine back on the rails as well as extensive track repair. A simple preventive measure for gauge spread is to install Aldon double-ended gauge control rods every 8 feet in high traffic track. If your switches do not have gauge plates at the points end, install a double-ended gauge rod at the approach to the switch as well. 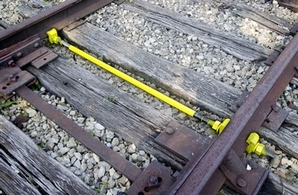 A pair or iron jaws at each end of the double-ended gauge rod grip the rail base to hold the rails to gauge and keep the rails upright against wheel pressure. Made for standard gauge 56-½" track and rail sizes 60-140 lbs./yd. Can be furnished in insulated form and for narrow gauge at extra cost.